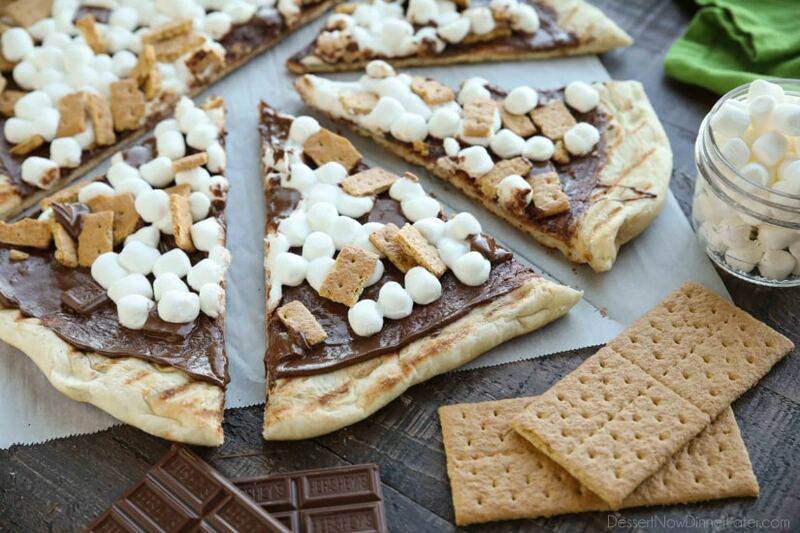 Grilled S'mores Pizza - Dessert Now, Dinner Later! Make your dessert outside! 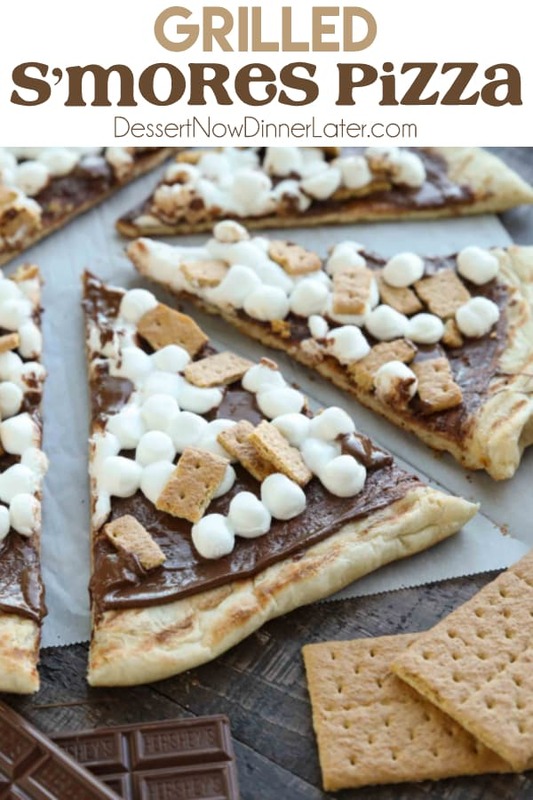 This Grilled S’mores Pizza is an easy and delicious dessert with all the flavors of everyone’s favorite campfire treat! Summer break is in full swing and we are enjoying cooking outdoors! 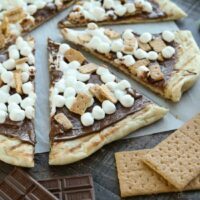 So much so, that we decided to try dessert on the grill with this Grilled S’mores Pizza, and my kids could not get enough! We’ve made Barbeque Chicken Pizza and Buffalo Chicken Pizza on the grill, but never a dessert pizza. 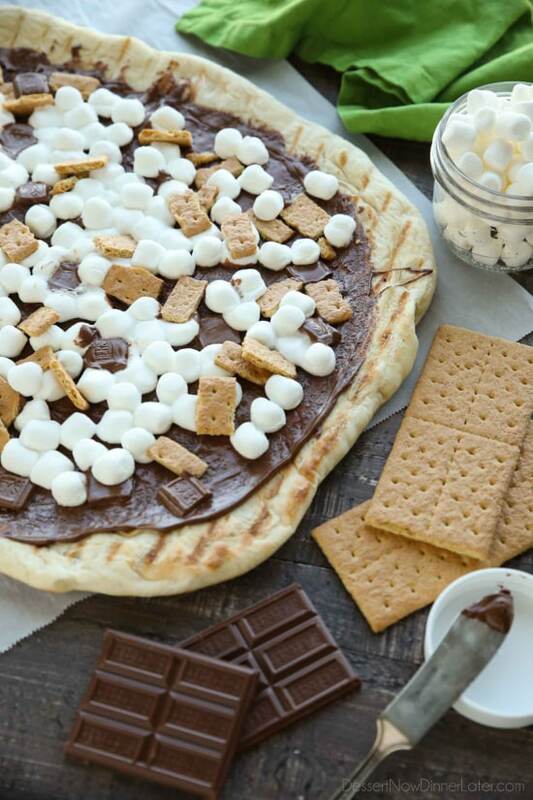 I’m so glad we did though, because this s’mores pizza was a hit! 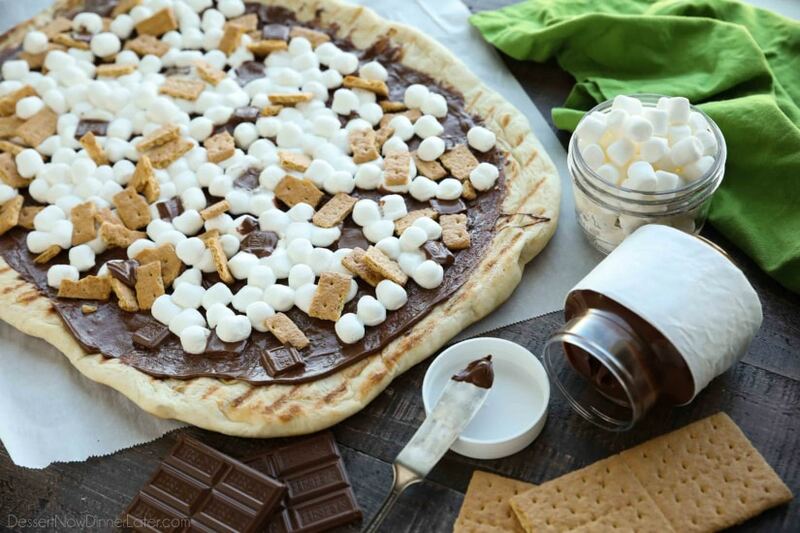 Real yeast dough is grilled and topped with chocolate hazelnut spread, marshmallows, graham crackers and chocolate bar pieces to make this s’mores pizza. It’s ooey gooey delicious! Whenever I make pizza, I use a loaf of Rhodes White Bread. It’s the perfect size and I don’t have to mess with making a dough from scratch. 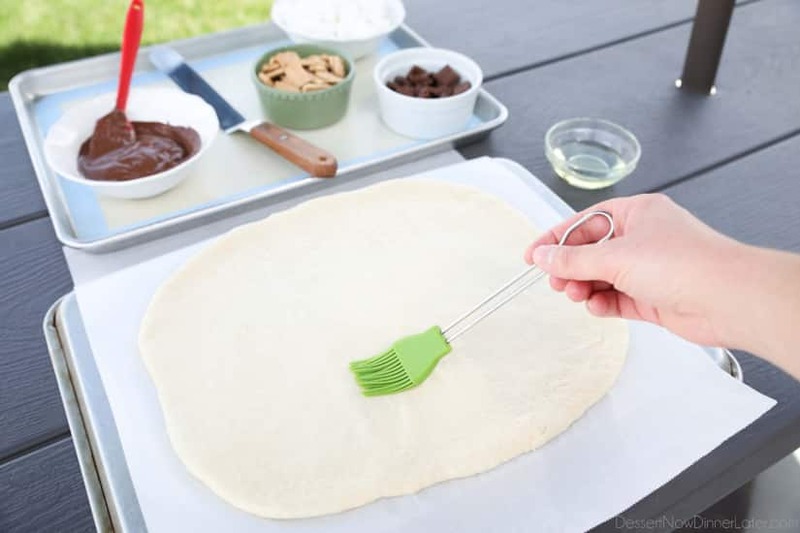 Roll out the dough into a circle onto a piece of parchment paper. I used a little flour to keep it from sticking to my surface. Preheat a gas grill until nice and hot, then turn the heat down as low as it will go. 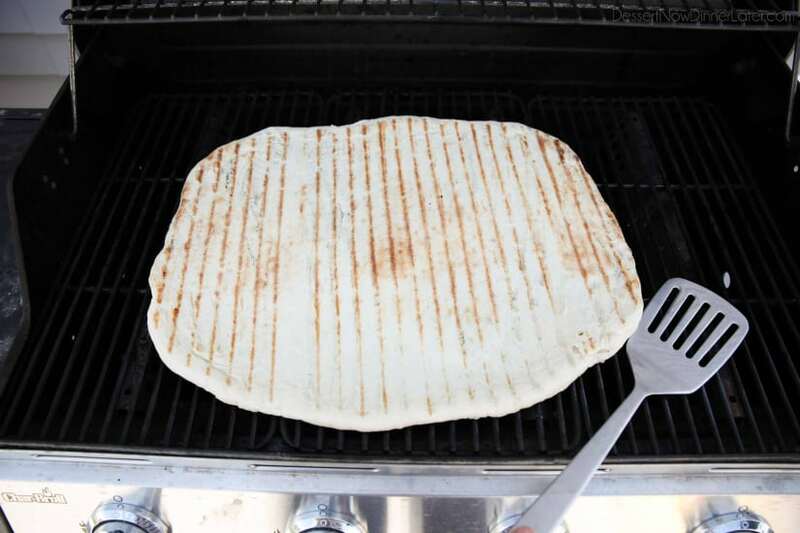 To grill the pizza dough, you’ll brush oil on one side of the dough. Then place the oil side down onto a preheated grill. Cook for 2-3 minutes, checking for the dough to look puffed, and golden brown on the bottom. Lightly brush the top side of the dough with oil, and flip it over. 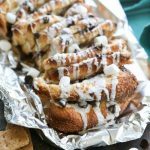 Immediately slather the chocolate hazelnut spread over the cooked side of the dough and top with mini marshmallows, chopped graham crackers, and chocolate pieces. Close the lid and cook 2-3 more minutes until the bottom of the crust is golden and the marshmallows on top puff slightly. 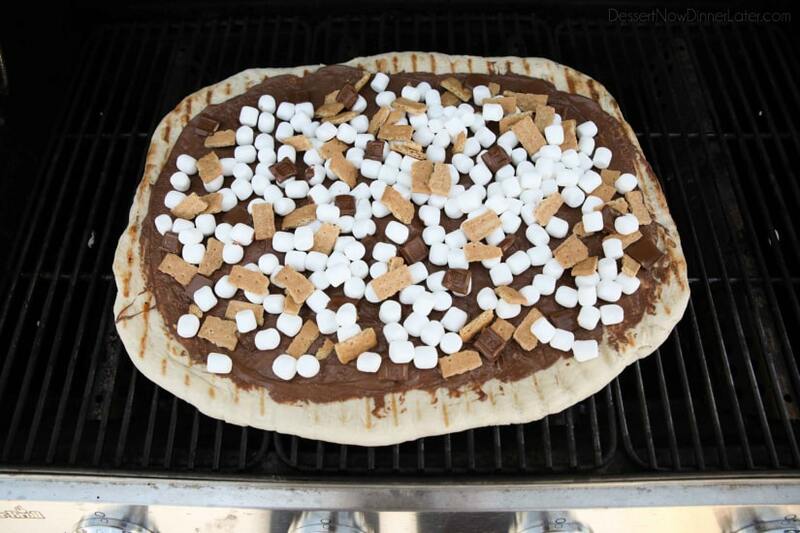 Remove s’mores pizza from the grill onto a large cutting board. Grease a pizza cutter with cooking spray and cut the pizza while still warm. (The cooking spray keeps the marshmallows from sticking.) Enjoy immediately. 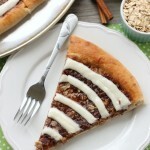 My kids seriously devoured this s’mores pizza so fast! They thought it was the best thing ever! I hope you get the chance to try it too! Roll out the dough into a circle onto a piece of parchment paper. Use a little flour to keep it from sticking, if needed. 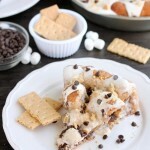 Roughly chop the graham crackers and chocolate bar into desirable chunks. Set aside. Melt chocolate hazelnut spread in a bowl in the microwave for 15-30 seconds, to an easily spreadable consistency. Set aside. Brush oil on one side of the dough. Place the oil side down onto a preheated grill. Cook for 2-3 minutes, checking for the dough to look puffed, and golden brown on the bottom. Lightly brush the top side of the dough with oil, and flip it over. 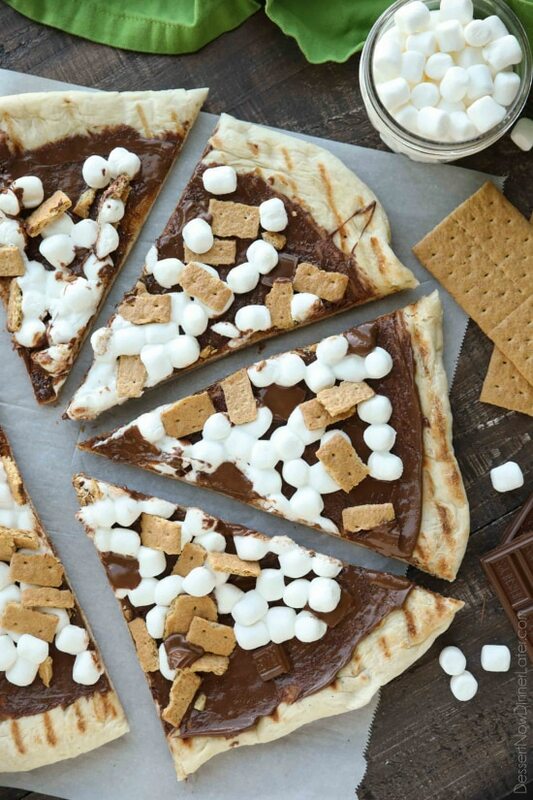 Remove the s’mores pizza from the grill onto a large cutting board. Grease a pizza cutter with cooking spray and cut the pizza while still warm. (The cooking spray keeps the marshmallows from sticking.) Enjoy immediately. To cook in the oven: Preheat oven to 425 degrees Fahrenheit. Cook crust for 5 minutes. 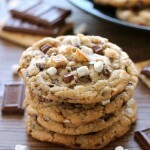 Remove, slather hazelnut spread, and top with marshmallows, graham crackers, and chocolate pieces. Return to oven for another 5-8 minutes until the crust browns and the marshmallows puff up and brown slightly.